My family has been very active since the new year. We have been going to the gym very regularly, eating a healthy diet, and we have been exploring out world more. We have been hiking a lot lately. The key to making a great hike is always being prepared, which means we always make sure to pack tons of options. My kids have been HUGE fans of Honest Kids juices for a few years now. In fact, this is the only juice my daughter will drink these days! So I'm very excited that they are now sold at many grocery and big box stores in a new 10 count pack. They are USDA Organic, Gluten Free, and made with No GMOs. No GMOs means that if there is a bioengineered version of an ingredient, they don't use it. There is also no high fructose corn syrup, 100% daily value of vitamin C, and sweetened with only fruit juice. Honest Tea seeks to create and promote great-tasting, healthier, organic beverages. They strive to grow their business with the same honesty and integrity they use to craft their products, with sustainability and great taste for all. They have a range of products to choose from as well as vast variety of flavors. My children loved the Honest Kids they received and their favorite flavor was the fruit punch which has grape, strawberry, and watermelon juices. 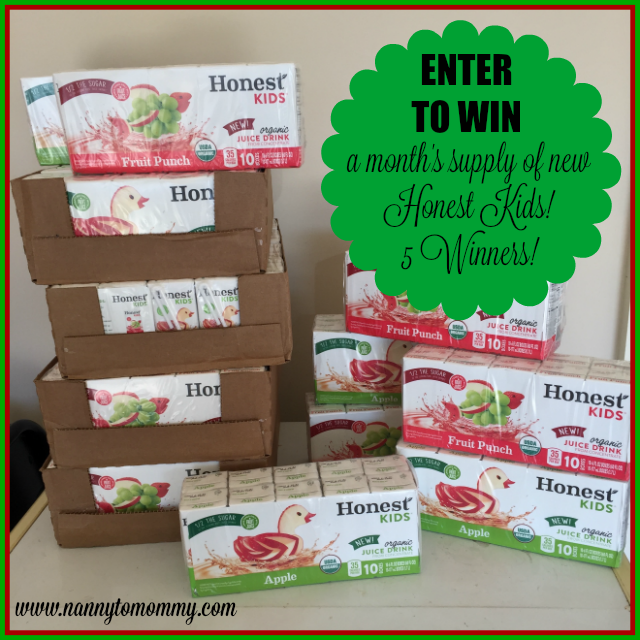 FIVE winners will receive a MONTH's supply of new Honest Kids! Entry is simple, just follow the prompts on the Rafflecopter below. Open to US only, must be 18+ to enter. Winners are chosen via Random.org through Rafflecopter, all winning entries are verified. Make sure to follow us on Facebook to keep up with our current giveaways. Good luck! This post has been sponsored by Honest Tea. All thoughts and reviews are my own. Nanny to Mommy is not responsible for sponsors who fail to fulfill their prize obligations. Facebook, Twitter, Pinterest and any other social media are not affiliated with this giveaway. Nanny to Mommy received complimentary products to provide this review/giveaway. All opinions are my own. This giveaway is open to US only, must be 18+ to enter. Cannot be shipped to P.O. boxes. One entry per household/IP address. No social media was involved in this giveaway in any way. Winner is chosen via Random.org through Rafflecopter. ALL winning entries ARE verified. Winner will have 48 hours to respond with all information in email or another winner will be chosen. If you would like to see your product featured on our blog or sponsor a giveaway event, please contact us. Fruit Punch is a fave! My kids would like the Apple the best. I would be most excited for the strawberry flavor. I would love to try watermelon one! Awesome give away!!! I would like to try the fruit punch. I would prefer the fruit punch. My kids would want to try the Fruit Punch first! My kids would love the Fruit Punch ! We would all love to try the apple flavored one! We all love apple juice in this house. We would love both flavors I'm sure! Fruit punch would probably be my own personal favorite. My son would probably love them both equally. The fruit punch flavor sounds good! I really would love to try the apple juice! I've tried all of them. Everyone always prefers fruit punch. Apple juice always disappears the quickest in my house. I would love to try the fruit punch myself! Fruit punch!! Yummo!! Its our absolute favorite in this house! I think I would most like to try the fruit punch. They all sound good though! I'm most interested in trying Apple. My kids love Apple juice! My daughters like fruit punch. Comment on the Giveaway post: "What flavor are you most interested to try?" the apple looks good..hope this is just not for kids.. I would be most interested to try Fruit Punch please. kristiedonelson(at)gmail(dot)com Thank you. Happy February! I am most interested in the apple juice! Im most interested in trying the apple. My kids would like Fruit Punch! We are excited to try their apple juice boxes. These sound very nice. I am most interested in trying the Fruit Punch flavor, but I think my son would love the apple flavor more. I would love to try fruit punch. My family loves it. We love the Fruit Punch! My niece and nephews would love these, they'd love the apple! i am more interested in the fruit punch . My family loves the grape! My grandson & I like the berry berry lemonade. I would love to try apple flavor. We love both, but fruit punch is my son's favorite! We love both in our house, but Fruit Punch is my son's favorite! My grand kids would love to try the apple flavor. My sons love grape and fruit punch so those would be the ones I would love to try. The fruit punch flavor is so refreshing!!! I want to try the applely apple one, my daughter has tried the fruit punch and grape but not the apple... yet. Would like to try the fruit punch. My son loves fruit punch. Love how healthy Honest Tea and Honest Kids are! We definitely want to try the fruit punch first! Thanks! I think my grandchildren will love the fruit punch flavor! My kids will drink any and every flavor! ��Haven't found one they don't like! My son loves fruit punch but lately the fruit punches we've tried just taste like sugar water with some medicine like fruit flavoring instead of actual juice. So we would be excited to try the Honest Kids Fruit Punch. I always liked the flavor of fruit punch, though I haven't tried the honest companies version. I would like to try the fruit punch. Oh, this sounds awesome!! 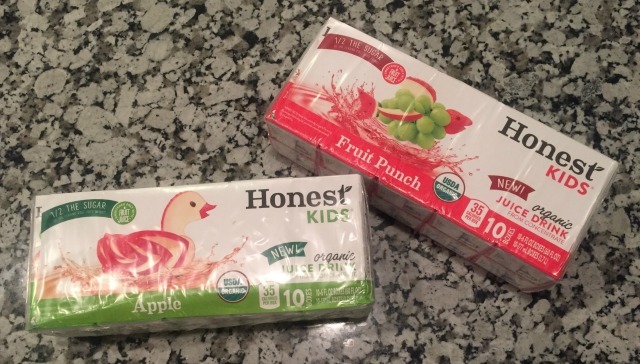 We've been looking for Honest juice boxes and couldn't find them anywhere.. a little boy in my daughter's class always has them and mostly grape, which I would LOVE to know where are they being sold if anyone knows :) my daughter has tried he fruit punch once at Wendy's and loved it! I would look forward to trying their fruit punch. Our three year old daughter is a HUGE apple juice fan. I know she'd love to try theirs! Fruit Punch! We have actually tried it before and it is our fave too! I would love to try the watermelon flavor.Honest Tea makes the best drinks,our family loves them! Fruit Punch! You can't go wrong if it has watermelon juice in it! Thank you! We love fruit punch and apple! I know we would like the watermelon, strawberry and the grape. They sound great and I am glad they are so healthy! My twins love fruit punch, so I would like to try that one. My 2 daughters love fruit punch! We love them all! They make packing snacks so much easier! I would like to try their Apple juice with my little ones. Thank you for this chance! The watermelon sounds really good! I love Honst Tea. Their products are so good! My son loves these drinks. I would love to try the Fruit Punch flavor. With watermelon we can't go wrong. My kids would love the Fruit Punch and the Apple! Would love to try the fruit punch! Oh I think our favorite would be the Fruit Punch! My daughter would definitely love to try the fruit punch flavor. I would like to try the fruit punch flavor. I'd love to try the apple flavor of Honest Kids for my grandkids. I want to try fruit punch! I am most interested in trying their apple. I want to try the Fruit Punch most of all! I am most interested in trying the Fruit Punch flavor. My kids love the Organic Appley Ever After flavor the most in Honest Kids drinks. I am most interested in the Fruit Punch flavor. I know my children would love it. I would love to try apple or strawberry. I am most interested in trying the fruit punch. My granddaughters would like to try the fruit punch.